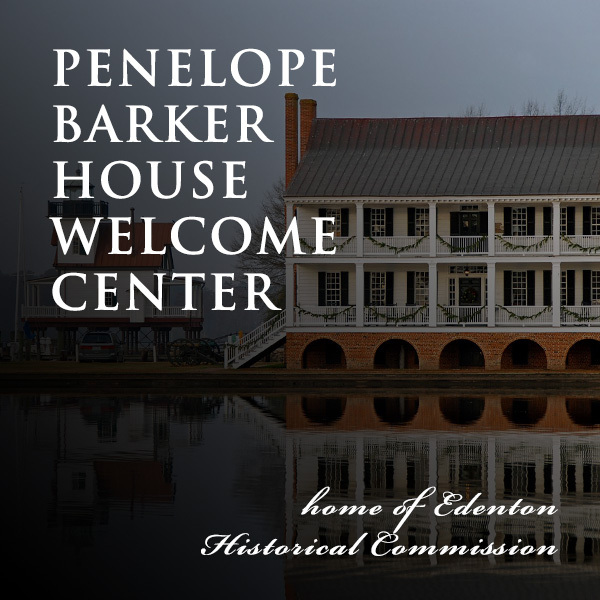 Monday - Sunday 10:00 a.m. - 4:00 p.m.
Home to the Edenton Historical Commission, the Penelope Barker House Welcome Center is located in the heart of Edenton, one of south’s most picturesque towns. Our mission is to educate visitors on the rich history of the area as well as provide information and assistance to guide you on your visit to Edenton. If you are interested in exploring the history and sites of our town, you are sure to find what you are looking for at the Penelope Barker House Welcome Center in Edenton. The Edenton Historical Commission is housed in the former home of Penelope Barker, also known as the Mother of Women’s Political Liberation. She is considered by many to be one of the most courageous figures in U.S. history. Her 1774 tea party was the first women’s political activity in colonial American and western history, and paved the way for the rights of women in politics. She is one of the many historic leaders and places showcased at the Edenton Historical Commission. Be sure to plan your visit to Edenton soon, and enjoy one of America’s prettiest towns. Tour the Barker House, navigate our Museum Trail, explore the carefully preserved original structures, visit the downtown shops and restaurants, or take a trolley ride. The Penelope Barker House Welcome Center is open to the public seven days a week. We look forward to welcoming you and helping to make your experience in Edenton the best it can be!